Welcome to Prepaid Phone News' regular Sunday Prepaid Phones on Sale this Week feature listing of all current US prepaid phone deals in one place. 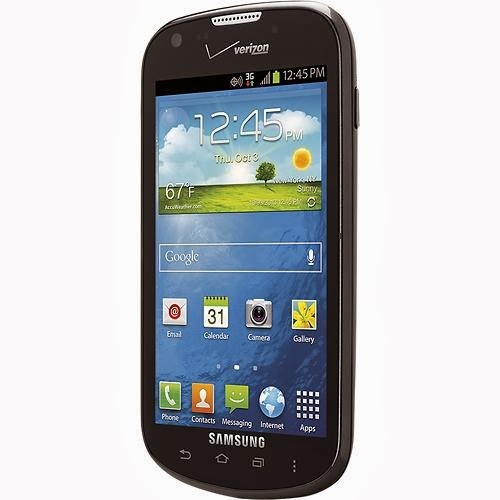 The deal of the week is the Verizon Prepaid Samsung Galaxy Legend Android phone on sale for $79.99 with purchase of a $60 or $70 monthly plan on the Verizon site or for $99.99 outright at BestBuy. The Legend runs Android 4.1.2 Jelly Bean and has a 4 inch 480x800px screen, 1.2 Ghz dual-core processor, 1GB of RAM, a 3.2 MP auto focus main camera and 1.3 MP front facing camera for video chats. AT&T (online only) The AT&T website offers free shipping on all phones and $5-$30 online-only discounts on most phones. There are some especially good good deals on "Certified Like-New" (aka refurbished) phones which are listed below. Boost Mobile free 3 day shipping on all phones. NET10 (online only) Free ground shipping on orders of $19.99 or more. Not all phones are available in all areas. Free reconditioned LG 300G candy bar with purchase of a $25 refill card. Free reconditioned Samsung Galaxy Precedent (Sprint) Android phone with purchase of a $50 Unlimited or $65 Unlimited International refill card. Straight Talk (online only) Free ground shipping on phones $29.99 and up. Not all phones available in all markets. Free reconditioned Samsung T528G touchscreen or Motorola W418G flip phone or LG 620G slider with purchase of a $45 Unlimited refill or $60 International Unlimited refill. Tracfone (online only) Free 3 day shipping on orders of $19.99 or more. Not all phones available in all markets. Use promo code FRIEND1 to get $5 off any phone $9.99 or higher. Verizon Online only. Free shipping, free activation on monthly plans. Mobile Karma has 253 items on sale for 15% off. Use SCARYMK13 to get 10% off any purchase of $31 or more. TODAY ONLY. By the way, I've been using your site for the past few weeks as a great source of information that helped me change carriers for one of my phones, and I consider it for changing carriers for another. This has included the news-by-carrier section at the right. However, Dennis, I just now discovered one over the weekend, Consumer Cellular, which isn't even mentioned there, and I might today go with them after I stumbled upon mentions of it in user comments. Is it really so horrible as not to be mentioned, or is it one of a class of a zillion tiny MVNO's that I was not aware of previously that flies "under the radar" and is not worth mention on your site? They are good, but they are postpaid service. Not prepaid. You should add the iPhone 5 at Virgin Mobile for $404.99. Lowest price ever for a new iPhone 5. Added, thanks for spotting this deal and letting me know.